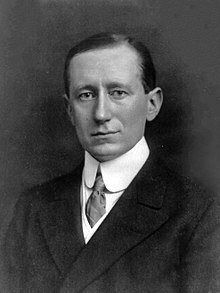 Guglielmo Marconi, 1st Marquis o Marconi (Italian: [ɡuʎˈʎɛlmo maɾˈkoːni]; 25 Apryle 1874 – 20 Julie 1937) wis an Italian inventor an electrical ingineer, kent for his pioneerin wirk on lang-distance radio transmission an for his development o Marconi's law an a radio telegraph seestem. He is creditit as the inventor o radio, an he shared the 1909 Nobel Prize in Pheesics wi Karl Ferdinand Braun "in recogneetion o thair contreibutions tae the development o wireless telegrafie". Marconi wis an aw an entrepreneur, businessman, and foonder o The Wireless Telegraph & Signal Company in the Unitit Kinrick in 1897 (that becam the Marconi Company). He succeedit in makkin an ingineerin an commercial success o radio bi innovatin an biggin on the wark o previous experimenters an pheesicists. In 1929, Marconi wis ennobled as a Marchese (marquis) bi Keeng Victor Emmanuel III o Italy, an, in 1931, he set up the Vatican Radio for Pape Pius XI. This page wis last eeditit on 20 Februar 2019, at 06:30.